Lesson 2: ‘Bad’ is a relative term. Some mutations are worse than others, and even really bad mutations can hide in a population. As we saw yesterday, mutations occur frequently in nature. Inheritance of parental traits is conservative, in that it is usually quite faithful; but if it is completely faithful, there can never be variation in a trait. Mutations counter this ‘copy fidelity’, acting as an opposing ‘force’ that produces variation. Dobzhansky inferred from this that all of the heritable variation that we see in nature is due to mutations that have occurred either recently or in the remote past. But for this to be true, mutations cannot be all bad. Some during his time viewed mutations as negative deviations from the well-adapted organism; selection’s job was to weed out these mutations to preserve the integrity of the species. In reality, says Dobzhansky, there is a huge gradient in the effect of a mutation, from lethal, to only somewhat harmful, to neutral, to valuable. As evidence of this, consider a complex experiment by Timofeef-Ressovsky (1934 and 1935) (I will call him TR for short). TR took inbred normal (what we in biology refer to as wild-type) Drosophila fruit fly males and he treated them with X-rays. Remember the importance of inbreeding in these experiments: it reduces genetic variation, such that all flies have approximately the same phenotypes. 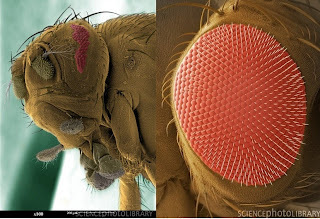 These mostly-identical flies were exposed to X-rays in an attempt to induce mutations in the genes being carried by their sperm cells. In this manner, new variations could arise in their offspring. TR then took a very special strain of female fruit flies. These females, like human females, have two X chromosomes. In this particular strain, one X chromosome contained a lethal allele (version) of a gene that was recessive. This lethal allele would only kill the female if she had two copies of it, but in this case the second X chromosome contained the normal, non-lethal allele. The lethal chromosome also contained a marker allele for a different gene; this marker, known as Bar, was dominant and therefore produced a noticeable effect on the female. Thus if any female died as an embryo, you would know it had two copies of the lethal X chromosome; if it had the visible marker and was alive, you would know it had only one copy of the lethal X chromosome. If it was alive and did not have the visible marker, you would know it had no copies of the lethal chromosome. Finally, this lethal chromosome also had an inversion (a region of genes that had flipped over so they were ‘backwards’ to a normal X chromosome), to prevent the lethal gene or marker gene from jumping over to the normal X chromosome (something known as crossing over or recombination, which is a quite common way for new varieties to be produced in sexual organisms, and another reason that inbreeding is so important for these experiments). These special females were then crossed with the X-ray subjected males. All of the females produced by this cross that showed the visible marker were therefore known to contain one lethal chromosome and one X-ray subjected mutant chromosome. These females were then crossed with normal (wild-type) males. Let us now ponder the effect that this should have on the offspring. First, all females inherited one wild X chromosome from the father. Half of them also received the lethal chromosome from the mother; the other half received the X-ray subjected chromosome from the mother. It was a different story for the males. Males only have one X chromosome to begin with (the other is a Y chromosome, just like in humans), meaning that any recessive allele on an X chromosome acts like a dominant allele in males. Therefore half of the males received the lethal X chromosome from the mother and died. All of the surviving males had to have inherited the X-rayed X chromosome. TR counted the number of males and females produced by this cross. Probability demanded that there be twice as many females as males, since half of the males died. Any deviation from this expectation had to be due to the effect of mutations that appeared in the X-rayed chromosomes. The effects were striking. This experiment was repeated for a number of crosses. In some crosses, no males at all were produced; the X-rays must have produced new lethal alleles. This is exactly what they expected if mutations are really bad things. But some crosses produced some males, and other crosses produced nearly as many males as expected. First of all, mutations can have small effects. A lethal mutation is a large effect, but they do not always need to be this way. Some produce so small of an effect that they are barely noticeable. Secondly, mutations can hide if they are recessive. All of the females survived, despite some of them having one copy of a new lethal allele. This means that, even if all mutations are bad, they should still persist in a natural population when they are carried by heterozygotes (individuals with two different alleles of the same gene, as opposed to homozygotes, individuals with two copies of the same allele for a gene). We see this today in haemophiliacs; some forms of haemophilia are recessive, and will only be expressed if the offspring receives two mutant chromosomes. There is therefore a hidden pool of recessive variation in any natural population. Thirdly, ‘bad’ is relative. For some crosses, these mutations were hardly bad at all, and did little to impact their survival. Thus they could survive and produce offspring, and pass on their mutations to future generations. This experiment showed, contrary to the wisdom of the time, that mutations can hide from selection either by being recessive, or by having a small effect. For Dobzhansky, this proved at least part of his belief that mutations had a gradient of effects. But up to now, he has not yet shown that mutations can be good things. I will leave that for tomorrow’s post. (As an aside, in case you were wondering, the 'Bar' marker itself was a mutation that a single male fruit fly was discovered to have in 1913).